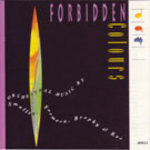 Forbidden colours : orchestral music by Smalley, Formosa, Brophy & Kos. 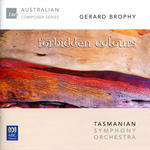 Forbidden colours / Gerard Brophy. Instrumentation: Flute, oboe, clarinet in B flat, bassoon, horn in F, trombone, percussion (2 players), celeste, harp, strings. 14 Jun 91: ABC Ferry Road Studio, Brisbane.. Featuring Queensland Symphony Orchestra, Myer Fredman.